TULARE COUNTY – Milo Gorden has been growing olives in the Lemon Cove and Ivanhoe area for 20 years, but this year may be his last. In fact, Gorden contends this may be one of the last years for California grown olives all together. Based in Corning, Calif., Bell-Carter is the largest olive processor in the nation. The company is best known for its Lindsay olive brand, which it purchased in 1990s after the Lindsay Olive Growers Plant was shuttered in Lindsay, Calif.
Gorden said Bell-Carter had contracts with growers up and down the state representing 10,000 acres, about 40% of which was in Tulare County. He said the timing of the announcement makes it impossible for growers to sign contacts with a new olive processing facility, and the only other processor, Musco Family Olives in Tracy, Calif., probably won’t be able to accommodate the massive influx of olives in while still meeting its obligations of its current contracts. Olives are harvested from mid-September through early November. Less than a year ago, Bell-Carter lodged an anti-dumping complaint with the U.S. International Trade Commission against foreign olives claiming Spanish olive growers, such as the world’s largest olive conglomerate Dcoop, were selling their olives at far below value because they were being heavily subsidized by the European Union. According to an industry news source, Olive Oil Times, the complaint led to the Trump Administration’s 37.4 percent tariff on black olives imposed last June. Two months later Dcoop and its Moroccan partner Devico purchased 20% of the stock in Bell-Carter, a move U.S. growers saw as an effort for Spain’s largest olive oil cooperatives to avoid paying tariffs. Dcoop exports about 7,700 tons of black and green olives to the U.S. but only 4,400 tons are subject to the tariff, according to the Olive Oil Times. “Spanish growers are heavily subsidized so they can offer a lower price that what processors can buy from us here,” Gorden said. The Tulare County Farm Bureau issued a statement on March 15 urging state and federal officials to take action to assist growers impacted by these contract cancellations. The farm bureau is asking legislators to close a loophole that allows foreign companies like Dcoop to acquire ownership in a U.S. based olive processor, which then flooded the market with cheap foreign olives displacing California growers. Specifically, the loophole allows Dcoop to avoid paying tariffs on their imported raw unprocessed olives. The Tulare County Farm Bureau said Bell-Carter’s decision could cost the area 4,500 acres of olives and an estimated 1500 jobs for farm workers who could find their annual income severely impacted. 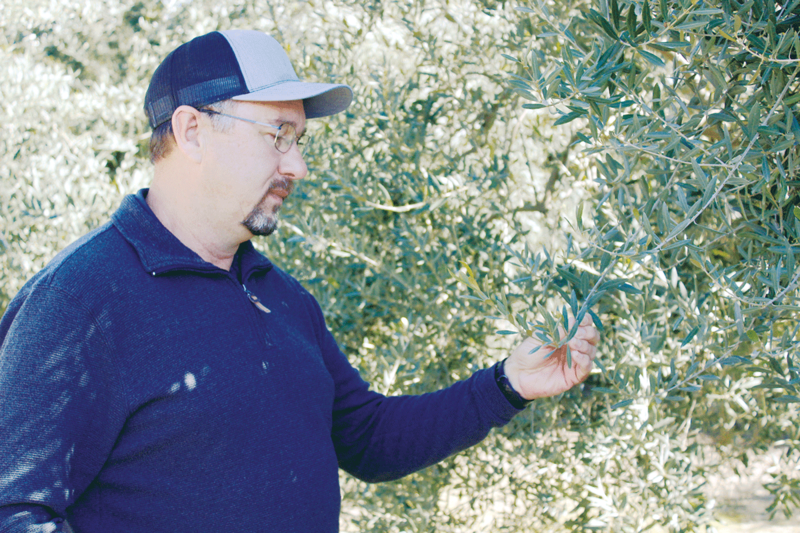 “These are highly skilled workers that will lose some of their most lucrative earning opportunity with this acreage going out of production,” stated olive grower Bill Ferry. Gorden said olive growers have slowly been reducing their acreage over the last 30 years in favor of more profitable crops, such as citrus. The cost of redeveloping acreage from one crop to another is about $10,000 per acre and it takes five years for the orchard to mature to its full commercial yield. Unfortunately, winter storms have brought an overabundance of rain and freezing temperatures which will likely have an effect on this year’s citrus crop.